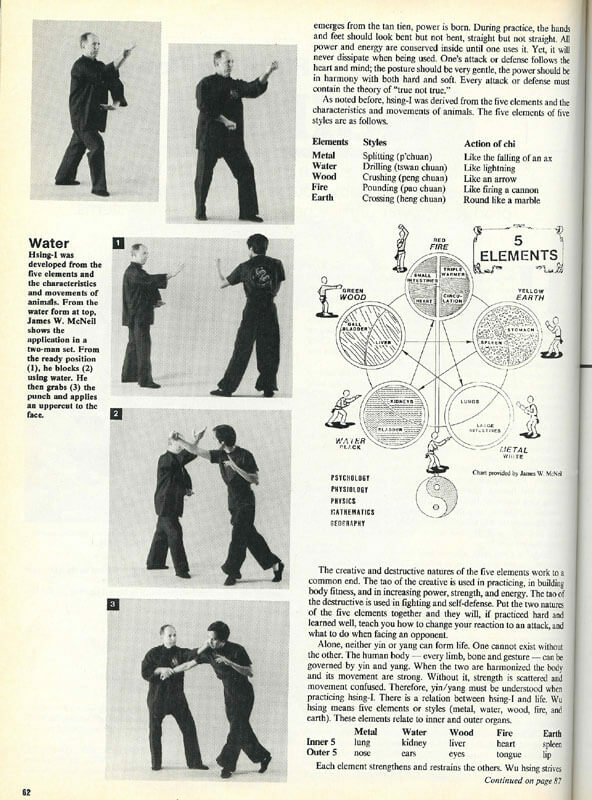 The five elements of Hsing-I were developed by observing and imitating the essential qualities of natural forces. Water always seeks its own level flowing downward and accumulating or sinking in. Fire, being less dense than water, rises. Wood can be made into a variety of shapes, either curved or straight. Metal can be forged, melted, refined and made pliable or unyielding. Earth is the source of nourishment and can generate all other elements. In Hsing-I theory, the basis of the complementary relationships among the five elements is defined by the principles of mutual creation and mutual destruction. According to the principle of mutual creation, metal creates water, water creates wood, wood creates fire, fire creates earth and earth creates metal. In nature, the geological and chemical forces at work within the earth serve to create metal. Metal itself becomes liquid as it melts when encountering sufficient heat. Water, combined with the nutrients of the earth, creates wood. With the proper application of friction and heat, wood, in turn, creates fire. When wood is reduced to ashes, it becomes a component of soil thus creating earth. The principle of mutual destruction holds that metal, in the form of tools, such as saws and axes, can destroy wood. The elements of water overcomes fire. Wood can overcome earth by depleting the minerals and nutrients which make it fertile. Fire consumes wood and earth traps water in depressions and dams. What makes this style so devastating? The eight fundamentals of Hsing-I, the theories touch-go-kiss, true not true, and the seven stars of Hsing-I along with the power of the five elements that follow the laws of nature makes it devastating. There is no power greater than the elements, for they constitute all power. There are three principles of Hsing-I: refine “ching” or seminal essence, to chi; refine chi to “shen”, or spiritual essence; refine “shen” back into emptiness, or prenatal awareness. The three major steps are: modify bones; modify muscles, modify the spinal cord. The three ways to practice Hsing-I are: visible strength, invisible strength, refined inner strength. These principles will help you transform your mind and body to its prenatal state. The Chinese believe that a child’s mind is like a blank tape. After years of problems and troubles, the slate must be wiped clean. This is the objective of Hsing-I. It is common knowledge that most children heal faster and are generally more fit and flexible than most adults. Returning to this condition will make you physically and mentally healthy and help prolong your life. Hsing-I involves two levels of study. 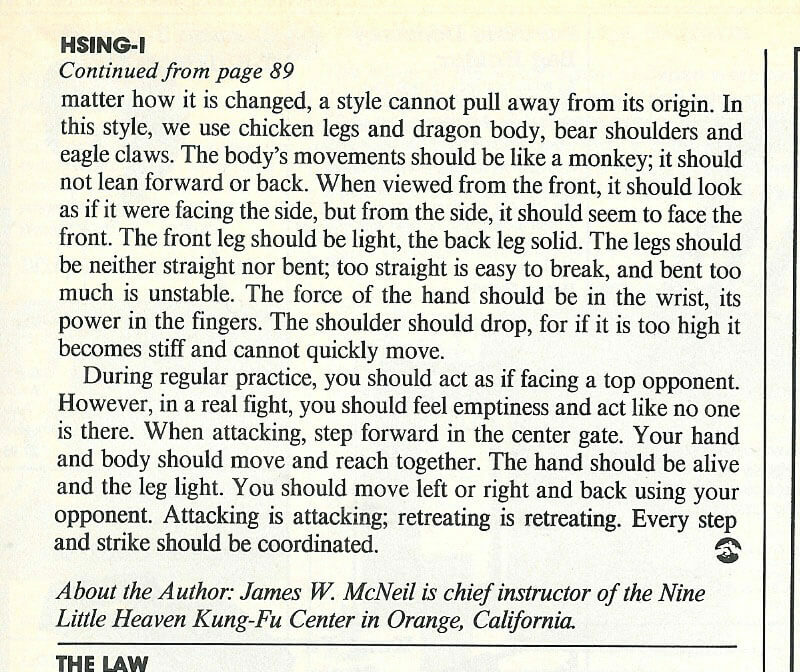 The first consists of understanding the way of power, naturally cultivating the chi and defeating an opponent in no sign. The second level consists of learning how to dissolve power, learning how to change the marrow in the body, and achieving a state of spiritual emptiness. 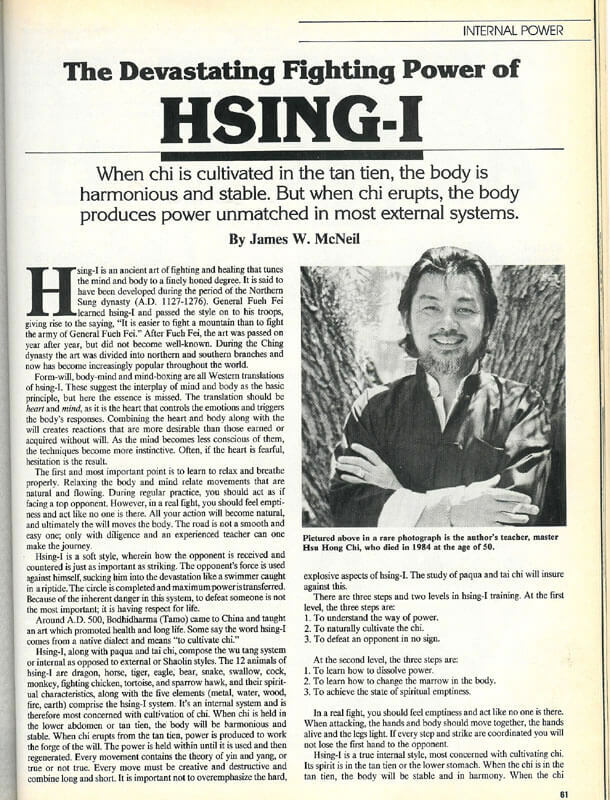 Hsing-I’s spirit lies in the tan-tien located about three inches below and three in from the navel. All power and energy are conserved inside until needed yet this power will never be fully tapped. One’s offense or defense follows the heart and mind. The posture should be gentle and the power should be in harmony with hard and soft. Head: The head is the headquarters of the body. When the head lifts, the chi can easily travel along the back of the body to the top of the head. This is very beneficial to one’s health. Tongue: When pressed upward against the palate, the tongue will help the chi to move downward to the tan tien. The tongue works as a switch with saliva as the conductor. This keeps the mouth in a condition which helps control thirst. Palm: When pressed outward in the proper position, the palm will help the chi extend to each part of the body. This also helps to strengthen the arms. Shoulder: The shoulders suppress, so that the front of the chest will feel empty and strength will flow down to the elbows. Hands: The hands and feet work as one unit. Suppress the hands with the upper arms, but be relaxed. The feet, waist and back are to be closely linked. Teeth: The teeth and chin suppress downward, so that the ligaments and bones feel tight. Back: The back is slightly rounded, so that one is relaxed and ready. Chest: The chest is rounded to give full strength when power is needed and to permit smooth, relaxed breathing. Hands: The hands will be rounded and relaxed so chi can be felt. Eyes: The eyes are sensitive windows and can give away one’s feelings. When facing an opponent you should be confident and fierce. Heart: The heart controls the mind, so the quality of your heart can either help or destroy you. One should be alert and clever and quickly respond. You must maintain a fierce attitude in life and death situations. Hands: The hands are sensitive so they will quickly move and respond to each situation. The hands will eventually become like the eyes. Body: Should never be leaning forward, backward, to the left or right, but should be straight. Shoulder: Should be downward. Let your shoulders move together. It is through the shoulders that the strength in the body is transferred to your hands. 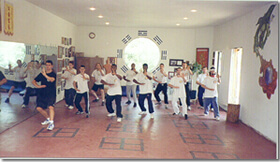 Arms: The left arm is stretched forward. The right arm is held close to your ribs. It should be bent but not contracted, stretched but not stiff. Too contracted, can never reach far. Too straight, it cannot be powerful. Hands: The right hand is held at the tan tien. The left hand is held at chest level. The latter is relaxed, the former should have strength. Both hands are held palms down. Strength in each hand should be even. Fingers: Each are separated and shaped as hooks. The index finger and thumb a crescent. The fingers are held with strength, but are not forced. Legs: The left leg is to the front, right leg held behind. Both are straight but not stiff, bowed slightly, yet straight overall. This is being ‘straight yet bowed like a chicken’. Feet: All toes pointing forward, never to the sides. Right back foot at a 45-degree sideward stance. Distance is up to the individual. Toes should be firm. Tongue: Chi will be weak if the tongue is not rolled. It sinks to the tan tien when the eyes are lowered. The muscles of the face are like iron and the inner organs strengthened. Hips: Tilted a little bit forward, so chi can be moved to the limbs. Otherwise it will be scattered throughout the body. 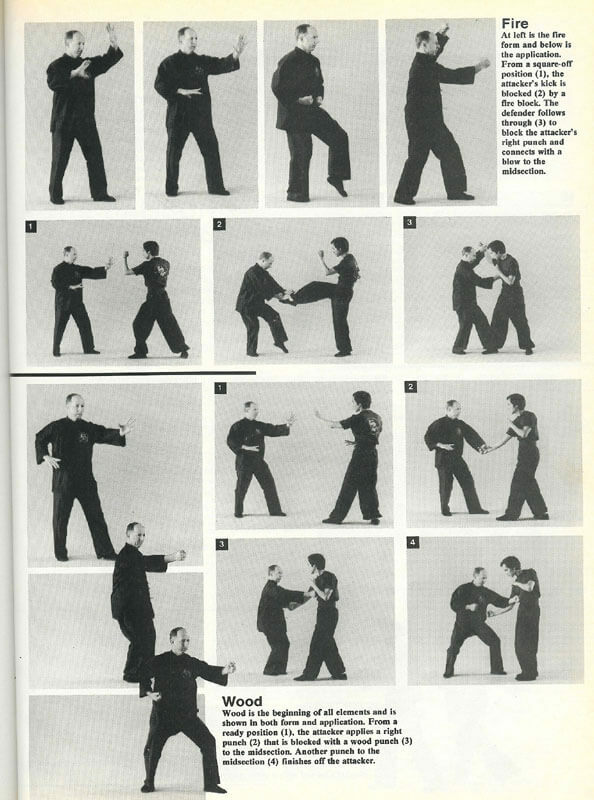 Hsing-I is an extremely powerful, yet practical self-defense fighting style. All the power is generated from the tan tien, the center of the body’s balance and energy. The rule of the six styles was developed to help one understand how the body acts. No matter how it is changed, a style cannot pull away from its origins. In Hsing-I, we use light and powerfully mobile chicken legs and the indomitable strength of the dragon body. This is combined with the engulfing, crushing force of bear shoulders and the gripping, rending slash of the eagle claws. The body movements should be like a monkey: neither leaning forward nor backward but must always be centered to facilitate for quick and balanced movement. The expulsion of breath is as the sound of thunder from within as the chi fills the body and begs release. When viewed from the front, the body should look as if it were facing to the side. From the side, it should seem to face the front. This is an extremely subtle compromise in body placement and can only be learned from a competent teacher. The front leg should be light, the back leg solid. The legs should be neither straight nor bent. If kept too straight or bent too much, you will be unstable. The force of the hand should be in the wrist and its power should be transmitted to the fingers. The shoulders should drop. If the shoulders are too high they become stiff and cannot move quickly into a full and devastating attack. The six styles are used in combination with the seven stars. A strike follows a chain of movements. It begins with the foot and follows through to every joint and finally ends at the hand. 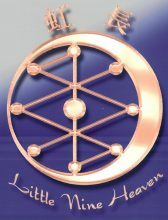 This creates the theory of the seven stars of Hsing-I. The seven stars are: the head, shoulder, elbow, hand, hip, knee and foot. They can be used either as a striking entity or in combination. They are the weapons of the human body that can attack with great power. With these rules come the means by which one can successfully deliver an attack. 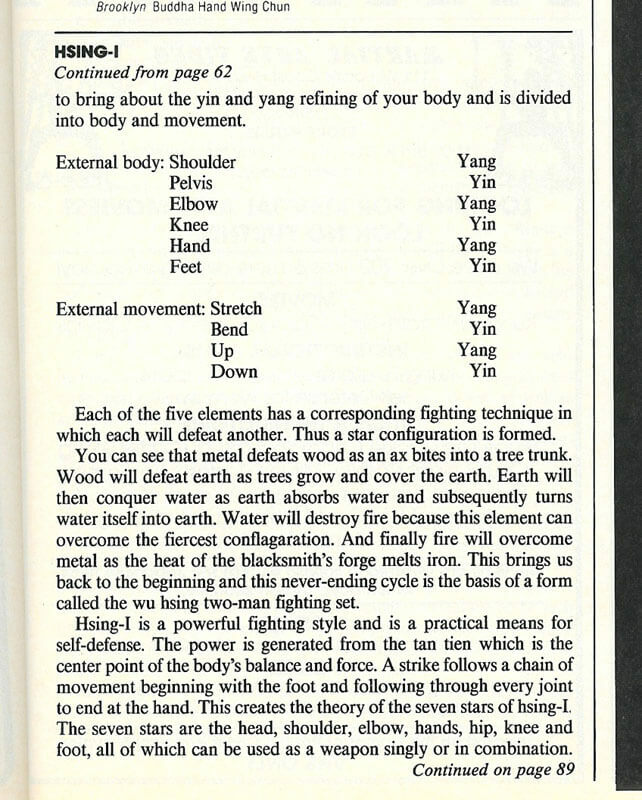 To use all of one’s inner power to move the hands and legs together. Fists as cannons and body as a dragon, alive and deadly. Move as if you have flames running all over your body in the face of an attacker. 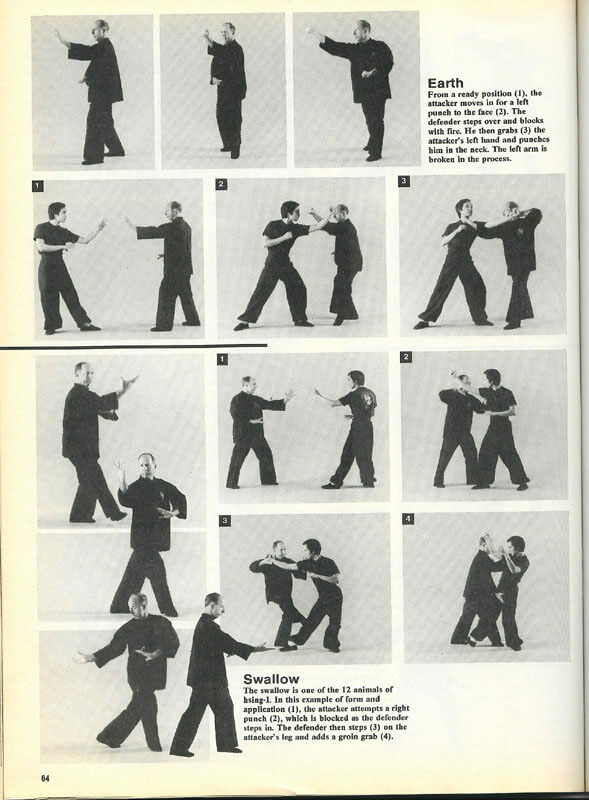 Head hit: The body moves as one. The feet are aligned under the body along the centerline. Shoulder hit: One is yin (back), one is yang (front) and the hands are hidden. The front hand is aligned with the nose to appear hidden from the front. The rear hand centers on the chest and seems concealed from the side. Use either right or left hand depending on the situation. Elbow hit: The elbow is bent and pointed down, the power explodes as the waist turns delivering a powerful blow to a vital point. a powerful tiger catching a delicate limb. The strength in your hands should instantly be interchangeable. Elbows are to be lowered to protect the body and explode with power. Hip hit: Yin or yang, left or right; it depends on the situation. Be natural while moving the feet and be quick as lighting while attacking. Knee hit: Knee strikes against any vital point can be fatal. The hands are held up in the front to balance the body. 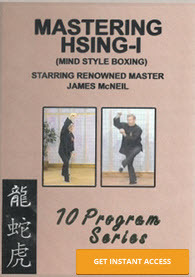 Hsing-I is an ancient art of fighting and healing that tunes the mind and body to a finely honed degree. It is said to have been developed during the period of the Northern Sung dynasty (A. D. 1127-1276). General Fueh Fei learned Hsing-I and passed the style on to his troops, giving rise to the saying “It is easier to fight a mountain than to fight the army of General Fueh Fei.” After Fueh Fei, the art was passed on year after year but did not become well known. During the Ching dynasty the art was divided into northern and southern branches and now has become increasingly popular throughout the world. 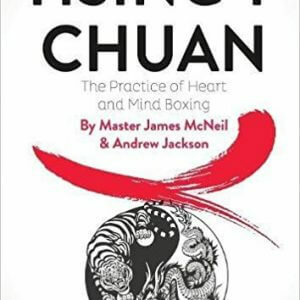 Form-will, body-mind, and mind-boxing are all Western translations of Hsing-I. These suggest the interplay of mind and body as the basic principle, but here the essence is missed. The translation should be heart and mind, as it is the heart that controls the emotions and triggers the body’s responses. Combining the heart and body along with the will creates reactions that are more desirable than those earned or acquired without the will. As the mind becomes less conscious of them, the techniques becomes more instinctive. Often, if the heart is fearful, hesitation is the result.